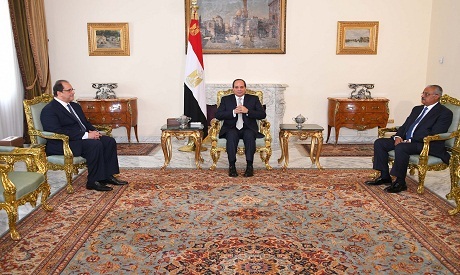 Egypt's President Abdel-Fattah El-Sisi met on Thursday with newly appointed head of the country's General Intelligence Service (GIS) Abbas Kamel. Kamel, who had previously served as the presidency chief-of staff, took the constitutional oath before President El-Sisi along with the deputy intelligence chief Nasser Fahmy. During the meeting, the president praised the tireless efforts by GIS members in the face of regional challenges and their impact on Egyptian national security. Before he was officially appointed to the post, Kamel temporarily served as acting chief of intelligence since January, succeeding Khaled Fawzy, who had held the office of GIS chief since 2014. Kamel was born in 1957 and graduated the military academy in 1987 as an armoured vehicles officer. He received the advanced armoured vehicles course in the United States, as well as the strategic military attaché course from the Geneva Centre for Security Policy (GCSP). Kamel also completed the Egyptian Armed Forces' high commanders courses and training. He was appointed as an assistant defence attaché in the Czech Republic. Kamel rose through the chain of command within the GIS until he headed the military attaché administration. He served as the office head of the Egyptian Armed Forces' General Command before being appointed as the presidency chief-of-staff in 2014. Kamel holds the Armed Forces long service medal and the Egyptian republic second class order of merit.